The dorm-style housing units slated to go up in Kelowna will look similar to these other Horizon North buildings. 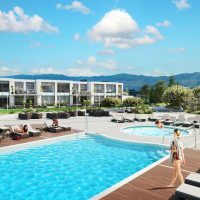 Kelowna business owners are pushing back against a new supportive housing complex set to go up in the Mill Creek Commerce Park. The project is part of a provincial government plan for several new supportive housing and shelter spaces in Kelowna, aimed at providing much-needed support for the city’s homeless. 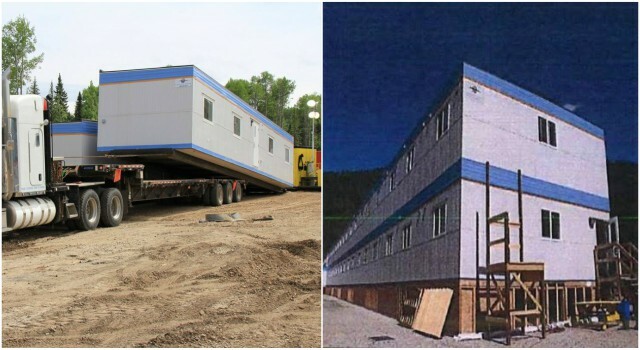 It would see 55 units of temporary, modular housing stacked into a two-storey structure, on a property at 1642 Commerce Ave.
Tony Gaspari, one of the developers of the Mill Creek Commerce Park, says nearby business owners are upset they weren’t consulted about the project before plans were put in place. He said most didn’t have any idea the project was happening until media organizations began asking them to weigh in on it. “We were actually shocked that we hadn’t received any notice from the city of Kelowna. There’s no signs posted, nobody’s called… So it was an unusual thing, for sure,” he said. Gaspari said it’s not the project’s aim that business have an issue with, but how it is being executed. Gaspari said many are worried the spartan, repurposed modular units that will make up the development won’t fit the form and character of the surrounding area. “Can you imagine having old construction trailers… stacked on top of each other in a long row in your backyard? I don’t think they’re doing anybody any good,” he said. 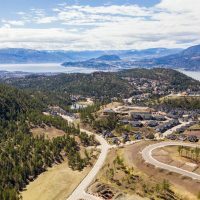 City of Kelowna representative Doug Gilchrist said the project has been accelerated because the city is trying to alleviate an “emergency situation,” and give people a place to stay before the coldest months of the year are upon them. “This is about people, and people’s lives, and with the cold weather coming it’s even more critical we have housing for people in need,” he said. He pointed out the property’s zoning allows it to be used for supportive housing, and that there is no bylaw requirement for public consultation with this kind of project. He said BC Housing “did issue a letter to the neighbourhood,” and also tried to meet one-on-one with at least some of the business owners. “To say they’ve done nothing is not accurate,” Gilchrist said. Gilchrist pointed out the housing project is temporary, and only meant to stay up while more permenant solutions are put in place (likely about four years). He and other nearby business owners are asking council to delay their decision on the project for a little longer, so there can be a more “fruitful” discussion. Next week’s council agenda has not yet been set, but Gilchrist said the development permit for the project will almost certainly be on it. BC Housing isn’t asking for any variances, which would traditionally mean no opportunity for the public to comment.